Vikki Reynolds PhD RCC is an activist/therapist who works to bridge social justice activism and community work. 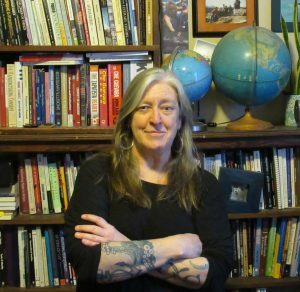 Her experience includes supervision and therapy with peer and other first-first responders to the opioid epidemic/poisonings, refugees and survivors of torture, sexualized violence counsellors, mental health and substance misuse counsellors, housing and shelter workers, activists, and working alongside gender and sexually diverse communities. Vikki is an Adjunct Professor and has written and presented internationally on the subjects of resistance to ‘trauma’, ally work, justice-doing, a supervision of solidarity, ethics, and innovative groupwork. In this series of talks, Vikki Reynolds, clinical supervisor and Adjunct Professor, addresses her work responding to the opioid epidemic/poisonings from a social justice approach. Vikki describes an alternative approach to understanding the ways workers are harmed in the work that is very different from the concepts of vicarious trauma or burnout. Instead of looking at workers’ traumatic symptoms, this approach looks at how workers treat clients, and whether they are able to create relationships of respect and dignity. Are workers responding to the heartbreaking work with disconnection, where they are moving too far away from their clients and taken with negativity and cynicism? Or are they moving in too close, with heroic posturing, becoming enmeshed and transgressing the boundaries of clients through transgressions of intimacy and enmeshment? Vikki believes that if we are able to hold clients at the center of our work and care, stay with connection, and resist disconnection and enmeshment, we are more able to resist burnout and create sustainability. The “Zone of Fabulousness” is the space wherein clients are at the center of the work, and workers are connected to each other through a collective ethics, shouldering each other up, bringing hope, and engaging in collective care that is in addition to self-care in collaborative, creative, messy and imperfect ways within their teams. Resisting burnout with justice-doing reflects an activist position for staying alive in our work. Vicarious trauma can focus on ways our clients’ pain infect us with hopelessness, yet often our clients inform, transform, educate, provoke and educate us. The harms in our work most often stem from structures that are oppressive and don’t allow for the resources needed to respond to human suffering. When we are able to enact our ethics, even when it is heartbreaking, sustainability becomes possible. However, working against our ethics leads to spiritual pain or ethical pain, which is a better way to understand the harms workers experience. If we can enact collective care, as opposed to only self-care, sustainability becomes possible, and we can act in solidarity to shoulder each other up as workers in the dark spaces of our work. Reynolds, V. (2011). Resisting burnout with justice-doing. The International Journal of Narrative Therapy and Community Work. (4) 27-45. A client-centered approach to understanding worker burnout looks at how we are holding the clients at the center of our work, which requires distinguishing between staff-centered teams and client-centered teams. When we are able to be with connection, we are enacting our collective ethics and collective care of each other, and we are more creative and messy with each other, and more useful to clients. This is the Zone of Fabulousness. Workers often leave the Zone of Fabulousness by moving too far away from clients into negativity and cynicism and disconnection, or conversely move into intimate boundary-transgressing relationships that can be heroic and enmeshed. We can’t keep ourselves ethical, connected, and in the Zone of Fabulousness on our own because good intentions aren’t enough. If we thought we were moving in unethical ways, we wouldn’t do it. When we slip into enmeshment and disconnection, we need our co-workers to act as our allies with the moral courage to offer us critique and bring us back to connection, collective ethics, and client-centered work. This requires creating cultures of accountability that rely upon our relationships with co-workers that are built on respect and dignity and a commitment to offer critique and shoulder each other up in ways that make us most useful to our clients. Reynolds, V. (2013). “Leaning in” as imperfect allies in community work. Narrative and Conflict: Explorations in theory and practice, 1(1), 53-75. To be truly client-centered, we are required to create relationships with co-workers that allow for a culture of critique. To do this we need to create intentional relationships of respect and dignity. This requires us to speak to each other about the heart of our work and the collective ethics that sustain us in the work. We need to be able to tell the difference between critique or criticism and attack. We also need to get comfortable with discomfort and distinguish between feeling uncomfortable and feeling truly unsafe. And our commitment to keeping clients at the heart of our work means we will need to have the moral courage to speak truth to power, and to hold each other to account. Reynolds, V. (2014). Centering ethics in therapeutic supervision: Fostering cultures of critique and structuring safety. The International Journal of Narrative Therapy and Community Work. No. 1, 1-13. Reynolds, V. (2009). Collective ethics as a path to resisting burnout. Insights: The Clinical Counsellor’s Magazine & News, December 2009, 6-7. Debriefing that is centered on traumatic details, happens too late, and has no structure for safety or usefulness can be retraumatizing to workers and lead to venting and despair. We’re looking to debrief in ways that honour connection, center our collective care, and are an enactment of our commitments to each other as co-workers. We begin by committing to connecting immediately following a traumatic event, co-regulating each other, and staying with connection to prevent further traumatizing each other. We know that the research for responding to the opioid epidemic/poisonings comes from the ‘first-first responders,’ and so our debriefing method needs to address these new learnings as well as incorporate a thorough critique of what needs to be different. When we are responding to the opioid epidemic/poisonings we are experiencing tragic deaths. This is very different from death as a part of life, where it can be meaningful and dignified. It is important for workers to differentiate between death from overdoses and death as a part of life, and to map our cultural, spiritual, familial, family of choice’s and social networks’ responses to death. Holding on with Letting Go (2017) – Responding ethically to tragic death requires intentional responses that invite workers to begin by witnessing the humanity of the people who have died. Workers are invited to acknowledge the lives, and not the deaths, of the deceased first, and to reflect upon their relationships with the deceased, centering not on traumatic details, but on our usefulness and connection to them. Workers should acknowledge that we learn our work on the backs of clients and that they have been our teachers. We are required to not let people who have died in the opioid epidemic/poisonings become just a number, and commit to keeping their teachings alive, resisting their disappearance, and working from our locations of privilege and access to power to resist and end this horror.